The H100, One Onch, 5 Gigs of Filez! By Mac.H on 08/10/05 • Leave a comment! The Koreans are at it again: this time with a tiny portable USB drive that crams 5 gigabytes of storage into an itty-bitty form factor. New World Net is best known in Korea for their line of MP3 players, but has yet to make a stab at the U.S. market. Since the H100 uses a 1″ micro hard drive as its memory instead of flash, I’d expect it to be cheaper than the 4gb USB flash keys we’ve seen recently. As usual, no word on availability stateside. So news of this thing’s been going around for more than, like, two days, but it’s very slick and deserves to be mentioned here. The roughly 2″ x 3″ video player is only a bit over half an inch thick and makes your iPod seem like an old cassette Walkman, (ok, maybe the Sport model with Auto-Reverse). You’d expect with that tiny size, the screen would be miniscule and unwatchable. Not the case, as the iRiver designers have evolved beyond using buttons as controls and squeezed every last millimeter of electro real estate for a bright, 2.2″ TFT full-color display. 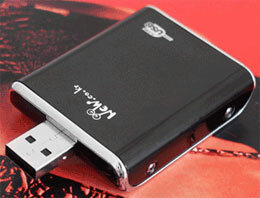 The flash version has no moving parts with storage in the 1 and 2GB variety. A hard drive based version will also be available with an alleged 8 gigs of media love via a 1″ Microdrive. You like specs and such? Come in. Korean upstart Gamepark Holdings may actually have a shot at the big boys (Sony & Nintendo) [Forgive him in his foolishness, for he is young -Ed.] 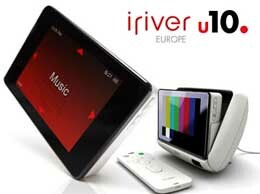 with its new GPX2 “Personal Entertainment Player” portable everything console. MPEG, MPEG4, Dvix 3.11,4x,5x, XVID, WMV, MP3,OGG,WMA, JPG, BMP, PCX, GIF. Oh yeah, it can also run emulators to play the 19 billion or so games made for MAME, SNES, Genesis, and PC Engine. The newly formed phone division of PC-hardware giant Asus is turning geek-heads with its new J105 phone, available now only in Taiwan. What sets this strikingly bland looking clamshell apart from the herd is basically some clever imaging software and a (very Asian) marketing campaign. 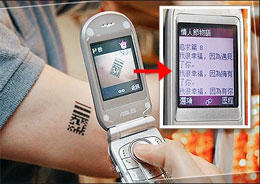 The phone’?s 2 megapixel camera can recognize and interpret QR Codes [the modern day barcodes of the East.] that people wear; reporting back stats and personal information about that person. These codes are omnipresent in many Asian cities and can be printed onto anything from stickers to, as seen in the press photo, temporary? tattoos. The premise is quite simple. You see someone interesting on your daily bullet train commute to SuperGlobalElectronics Concern, snap a picture of their barcode, and receive stats and information about that person immediately on your phone.